Assessing Commercial Real Estate Investments and Markets provides an excellent overview for institutional investors, says Academic Director Todd Sinai. Risks & Pitfalls: This program explores some of the risks of investing in real estate. Many institutional investors, fund managers, and financial advisors have been raising their targets for real estate allocations in recent years. Some classes of real estate investments can yield solid returns and provide good diversification. Others are higher risk, but potentially higher return, options compared to conventional assets of blue-chip stocks and bonds. Assessing Commercial Real Estate Investments and Markets provides institutional investors and financial advisors with a complete picture of the pros and cons of the various ways to invest in commercial real estate. Participants will become a more discerning evaluator of offers and opportunities in the U.S. and globally. Beyond just improving your awareness of common investing pitfalls, you will also discover how to make real estate a more valuable slice of your client’s or institution’s diversified investment portfolio. 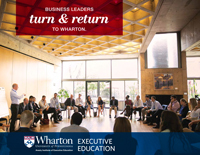 The Wharton faculty, who are the leading minds in real estate today, will explore the fundamental concepts around different commercial real estate asset classes such as hotels, apartment buildings, shopping centers, and office buildings, and the varied economic forces that drive their returns. The effect of location — including cities, countries, coasts, and neighborhoods — and their distinct risk and return characteristics will also be covered. You will investigate many real estate investment strategies: direct investment, investing in public equity, lending to real estate, investing in real estate debt, or investing in a company or private equity firm that is itself investing in real estate. The advantages and drawbacks of each will be thoroughly discussed, as well as the unique risks that accompany each approach. You will also hone your skills around global real estate investment, including diversifying your investments across countries, finding local partners, and assessing and hedging currency risks. Participants will discover how best to incorporate commercial real estate into their overall investment strategy. The current state of the U.S. and global real estate market will be discussed, and you will grasp the nuances of managing risk during boom and bust periods. Interactive exercises, case studies, and small-group breakouts make for engaging and thought-provoking sessions. As a result of attending this program, you will gain a deeper understanding of the concepts, terminology, strategies, and opportunities that will enable you to confidently add both domestic and global real estate to your investment portfolio. Global Perspective: Learn what to look for when investing globally. Professor Todd Sinai talks about Assessing Commercial Real Estate Investments and Markets in this interview on Wharton Business Radio, SiriusXM. Professor Todd Sinai on the classroom experience. This program is designed for those who invest large amounts of capital, such as institutional investors and financial advisors, who do not have a background specifically in real estate but who need to acquire or enhance their understanding of the sector or need a refresher on emerging real estate trends. This program is not for commercial real estate brokers, real estate developers, or other professionals whose primary focus is on the acquisition, construction, financing, or selling of commercial real estate. Ideally, participants should already have a grasp of concepts such as net present value (NPV), internal rate of return (IRR), free cash flow, discounted cash flow analysis, return on investment, and cost of capital. Familiarity with Microsoft Excel is expected. Additionally, this program provides an excellent learning opportunity for ultra-high-net-worth investors who are frequently pitched commercial real estate investment deals and wish to be better educated in the subject. The Assessing Commercial Real Estate Investments and Markets program was timely and just right for me to learn more about this alternative asset class. We were in the midst of developing a product program for the launch of our real estate fund, and this program was perfect to help us complete our product launch. We needed to go deeply into the many real estate investment strategies such as lending, direct investments, public equities, etc. and to better grasp the advantages and drawbacks of each. Attending the program provided us with the necessary tools, concepts, and strategies. We’ve gained clarity and confidence prior to rolling out our real estate fund. I returned to my organization with the critical insights and frameworks to structure our funds for the long run. I also came out of the program equipped with new strategies to enhance operational efficiencies, to create value through improvements in operations, and to analyze a pro forma. I gained a better understanding of how critical the capital structure is in real estate, and to slice and dice the capital stack. The session on what investors look at when going to countries outside of their home country was particularly valuable to me: understanding macro factors that make investors jittery such as a country’s foreign debt, foreign currency reserves, current account, and other factors. Moreover, the sessions on the changing face of real estate in cities, private equity investing, and property investing were all highly insightful and of immense value. The high caliber of both the faculty and the participants contributed much to the learning experience. The faculty’s broad range of expertise enabled them to take academic lessons and apply them to the real world. My peers were experienced and knowledgeable, which enhanced the interaction inside as well as outside the classroom." I found Assessing Commercial Real Estate Investments and Markets to be extremely helpful in understanding the metrics and evaluation tools used to assess commercial real estate investing opportunities for my real estate holdings family office. Learning about various formulae that weigh initial capital costs against future revenues, while suggesting the appropriate rents for various regions, were highlights of the course for me. I also learned a great deal about how REITs and other real estate investment trusts are structured, and how real estate bonds are structured and rated for risk. Finally, we learned about how real estate in rural markets varies from cities, and how to manage currency risk for foreign real estate investments. The faculty in Assessing Commercial Real Estate are simply amazing. Todd Sinai was fantastic; he patiently explained all of the basics of real estate investing and made some of the more complex subjects easy to understand. Maisy Wong’s global real estate cross-border investment strategy, and her discussion of how to hedge currency exposure, was simply brilliant. I also really enjoyed Asuka Nakahara’s speech about how to profit in real estate and learned a lot about how scale and location have a dramatic effect on the viability of real estate investment opportunities. I really enjoyed all of the faculty members and guest speakers, but these specific speakers had the most impact on my learning, and are therefore the most memorable for me. My company provides analytics for clients on the buy side and sell side of Wall Street. We deal with the analysis of securitized products, which have a number of different underlying products including commercial mortgage-backed securities. So in that respect we deal with real estate. The program was terrific and really well-structured. It covered all aspects of assessing and analyzing real estate investments. You gain an understanding of the risks and other aspects of real estate investment whether domestic or international. The lead professor, Todd Sinai, explained in detail about commercial real estate, real estate investment trusts, risk and pricing in housing markets, and taxation. I really enjoyed Asuka Nakahara’s discussion of how to analyze real estate as a regular individual, whether it’s buying a home or investing as a general partner into apartments, for example. Another big takeaway for me was pro forma modeling and analyzing: we looked at a number of scenarios — different economic conditions — and modeled how a real estate investment would perform. Also among my most valuable takeaways was an understanding of the risks and regulations involved in global investment. Maisy Wong brought us the global perspective, which was really an eye-opener for people who were not aware of some of the considerations of investing in other countries. Another important learning I acquired was how to identify an impending real estate crash. I appreciate having that perspective now. I have already adopted some of the techniques from the program in my everyday work. For a couple of clients for whom I’m analyzing their investments, I have been able to identify risk factor scenarios and risk analysis of various traded instruments. And I have a fuller understanding of the different factors that affect the risk analysis of the products my company buys and sells. I am an angel investor, helping communities set up businesses. I help them with funds, advisory services, and business development. I own some real estate properties in Canada, the U.S., and China — that’s another part of my business — and for quite some time I’ve been wanting to get more involved in the real estate industry. Assessing Commercial Real Estate Investments and Markets was an excellent program and was exactly what I was looking for. It helped me in many different areas. I am trying to extend my investments from residential to commercial, and it really helped me understand the big picture of the commercial real estate market. I appreciated learning more about different sectors such as apartment buildings, retail, and industrial. Another important area for me was ROI and risk analysis. I gained more insight into business ROI so I can measure and quantify my investments in more detail. While I have used traditional risk analysis tools in this space, the course expanded my vision into using other valuable tools. The professors, along with many of my classmates, provided me with a better understanding of market trends. This helped me define my next step in real estate investing. The program had a big impact on my business plan: I immediately changed my investment portfolio, and I purchased some REITs. Even when the stock market dropped recently, my REITs did pretty well. I have also decided to move some of my Canadian apartment building investments to the U.S., which is important to my plan. I am a professor of biostatistics and bioinformatics, so my professional job has no direct relationship with real estate. But I wanted to attend Assessing Commercial Real Estate Investments and Markets to understand the principles of real estate investment. I learned a lot from the program. It conveyed important information such as how to focus on the risk first, and how to use different techniques to project the profits and returns. The faculty were terrific. There is a reason these individuals get to teach at Wharton! The academic director, Todd Sinai, was very knowledgeable and friendly. He did a great job of bringing together all these excellent professors and selecting topics that covered every major area of real estate investing. The most interesting part of the course for me were the talks by Maisy Wong, who discussed international real estate investment. That really helped me open my mind and gave me a very good, real sense of how to do global investment. The concepts, knowledge, and skills taught in this course go beyond real estate to other investment areas, such as how to foresee and control risk, how to assess an offer and the return, and how to develop personal relationships in order to improve your investments. The most important part of the program for me was it emphasized that in the end, it’s all about the people: your partners, clients, and contractors.